Irish Shamrock Christmas Tree Ornaments for Sale! Presenting an Irish shamrock Christmas tree ornament with a double strand of authentic Swarovski rhinestones. Web pages copyright© 2003-2013 by DesignerOrnaments.com. All Rights Reserved. 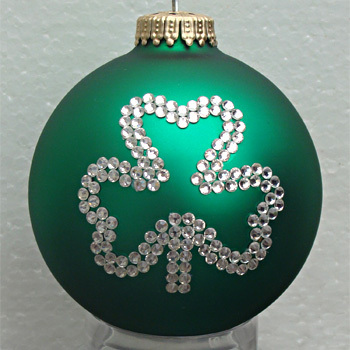 Irish shamrock Christmas tree ornaments with authentic Swarovski rhinestones can be purchased at Designer Ornaments. Irish shamrock Christmas tree ornaments depicting an Irish shamrock can be purchased at Designer Ornaments.